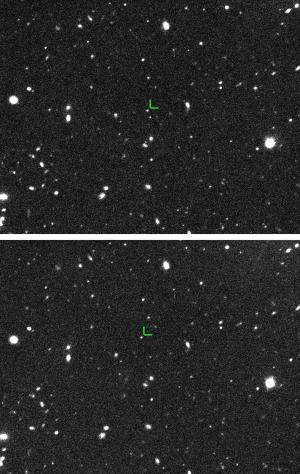 An article submitted for publication in “The Astronomical Journal” describes the discovery of 2015 TG387, an object with a length estimated around 300 kilometers (186 miles) whose distance from the Sun is about 80 times the Earth’s. A team of astronomers led by Scott Sheppard of the Carnegie Institution for Science saw it for the first time on October 13, 2015 during the research of another planet beyond Pluto’s orbit. The orbit of this object – which was nicknamed The Goblin – and those of the dwarf planet Sedna and the possible dwarf planet 2012 VP113 could be explained by the presence of a planet that’s still unknown. In recent years many new objects have been discovered beyond the orbit of Neptune and Pluto, contributing to the creation of the category of dwarf planets as some of them have a size similar to those of Pluto and Ceres. Despite the distance of several billions of kilometers, even smaller objects, with not longer than a few hundred kilometers, have been discovered revamping the search for full-fledged planets in the area of ​​the solar system known as the Kuiper Belt. A number of studies used data collected on the orbits of various Kuiper Belt objects to argue that they’re influenced by the gravity of much more massive objects. This conclusion is controversial, also because in the different researches the calculations were based on different groups of objects with the consequence that they support the existence of planets in very different positions and with very different masses. The risk is that focusing on a group of objects might provide an incomplete situation giving incorrect results. Another reason for controversy is the fact that astronomers are also discovering relatively small objects such as Ultima Thule, the target of NASA’s New Horizons space probe’s flyby for New Year’s Day 2019, so the fact that they can’t find a planet seems strange. The observations continue by various astronomers with different instruments and on October 13, 2015 the Subaru telescope in Hawaii allowed Scott Sheppard and his colleagues Chad Trujillo and David Tholen to discover 2015 TG387. Because of this object’s distance from the Sun, about 2.5 times Pluto’s, it took many months of observations of its movements, also with other telescopes, to obtain enough data to reconstruct its orbit. 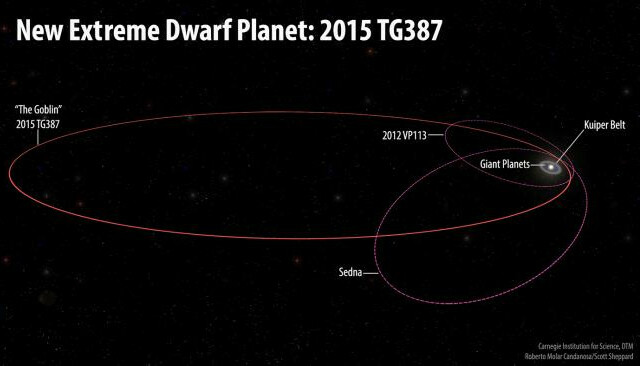 2015 TG387 is another possible dwarf planet but its length’s estimate in 300 kilometers is still too rough to establish its nature. The orbital data indicate that it’s very elliptical and today we can see it because it’s relatively close to the Sun while the estimate of its distance when it’s farthest from the Sun is 2,300 times the Earth’s. A year of 2015 TG387 lasts about 40,000 Earth’s years. 2015 TG387’s perihelion area is relatively close to that of Sedna and 2012 VP113, also discovered by Sheppard and Trujillo, whose orbits are illustrated in the bottom image (Roberto Molar Candanosa and Scott Sheppard, courtesy of Carnegie Institution for Science, all rights reserved). Other extreme trans-Neptunian objects, as they defined the ones whose perihelion is far beyond Neptune and have a large semi-major axis greater than 150 times the distance between the Earth and the Sun, have perihelion areas close to those objects. According to the discoverers of 2015 TG387 that’s an indication that something is affecting their orbits, something with the mass of a planet. To try to verify their hypothesis, Chad Trujillo worked with Nathan Kaib of the University of Oklahoma to create simulations of the possible influences of a hypothetical Planet X with different positions and different masses on the known objects. Their orbits are stable in the very long period in the presence of a super-Earth with a very elongated orbit and a distance from the Sun that could now be several hundred times the Earth’s, which means some tens of billions of kilometers. In essence, according to the researchers it’s possible that Planet X – or Planet 9 – is currently so far from the Sun that even the most powerful telescopes can’t detect it. David Tholen stated that there could also be thousands of smaller objects like 2015 TG387 in the Kuiper Belt and the problem of their detection is even greater. The opinions on the existence of trans-Neptunian planets are very mixed but astronomers agree that there’s still a lot to be understood on the Kuiper Belt and even more on the Oort cloud, an even farther area. Whenever a new object is discovered, new data get collected that could confirm or debunk the purely mathematical calculations underlying the conclusions about the existence of an unknown planet. In any case, these are very interesting studies because they extend our frontier and new surprises are always possible.